Padstow celebrates Mayday in a unique way, and the custom that has been carried out by Padstonians over centuries has not been allowed to die out. The exact origins of the tradition is unknown, but like other festivals during spring it is thought to be connected with the ancient Celtic festival of Beltane. Taken from ‘Historical Survey of the County of Cornwall’, published in 1820. Before the First world war there was only one hobby horse in Padstow, the old oss, but in 1919 the blue ribbon obby oss the was introduced. Also know as the temperance oss, its supporters tried to discourage the drunkeness associated with the custom. There are records of a few attempts to tackle the sometimes raucous behaviour asscociated with the festival, but none have ever worked. 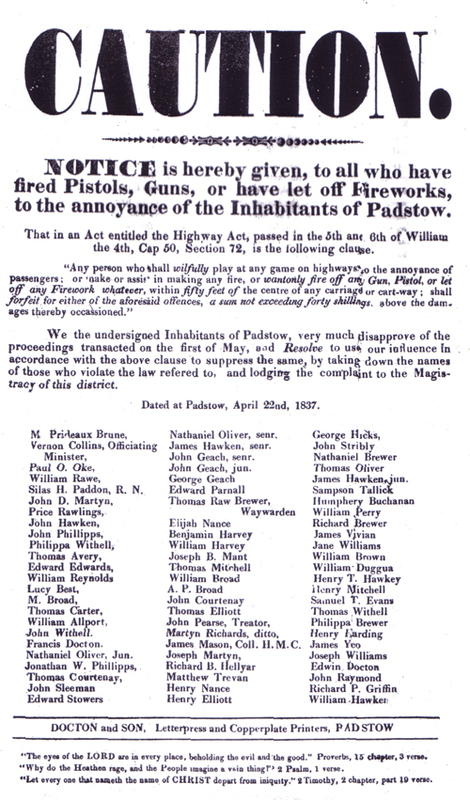 During 1837 some residents did not approve of people firing pistols in the air during the celebrations, and so rallied together to try and stop it by putting up posters which threatened people who did fire guns with a fine. The obby oss outfits are worn by various members of each group throughout the event, and they also take in turns teasing the oss. The teaser waves their teaser club in the air, and dances around the oss while leading it through the streets of the town. The two obby oss’s carry out similar parades at 2pm and 6pm, ending their day around the maypole on Broad Street. Just before it gets dark they are returned to their stables. All the supporters then meet up once again around the maypole at midnight to sing once again.